Roasted mushroom give a flavorsome dimension to this salad. This room temperature salad tastes delicious with bell peppers tossed with mild herbs, lime juice and topped with sesame seeds. They make a gorgeous salad or a side dish. Topped this vegetables with baked tofu is magical. When served with salad immediately after baking would add crispy bite to your salad. Place mushrooms in a large bowl with bell peppers, onion wedges. Add olive oil sprinkle with salt and pepper to taste. Toss well. Arrange in a single layer on large shallow baking pan and roast uncovered in the pre-heated oven at 200deg and bake for 15-18minutes/ until softened and sizzling (stir once half way). Drain water from tofu and pat dry with paper towels. Place it on plate line with paper towel set a weight on it to remove the moisture completely. Allow it to stand for 15-30 minutes. Once the moisture evaporates slice them as desired either cubes, slices or sticks . Whisk in the marinade ingredients in a bowl and gently toss in the tofu until coated and place in the fridge for 20-30 minutes. Combine roasted mushrooms, peppers drizzle some lime juice, sesame seeds, dried herbs, baked tofu toss lightly. Serve at room temperature as a side dish or on polenta for main course. Herbs and spices can be personalised as per the preference. Can include cherry tomatoes or any vegetables of choice as a variation. Tofu can be baked after roasting mushroom and peppers or can be baked in a different dish /tray. Posted on August 12, 2014, in International, Soups, Salad and Wraps, Vegan and tagged Chitras healthy kitchen, drchdietfood, Vegan Salad, Vegan salad recipes. Bookmark the permalink. 16 Comments. I’ve been having trouble leaving messages on your blog but I think I figured out the glitch. I have been enjoying all of your posts. They are so professional and delicious looking. I had tried tofu once but must have prepared it improperly, for it was awful but your recipes make it look worthy of a second try! Thank you so much for your hard work. Also, I do not know if you have heard yet but our beloved friend, I sad to report, Ajaytao, has lost his battle with illness. He died on Sunday Aug. 10, 2014. My heartfelt condolences to him..though I had every few conversations but could how wonderful human being he was..really shocked with this news…pray his soul will RIP..you are kind enough to visit me.. Thanks Baby..you make my day with positive feedbacks.. I love how you always have a way of making food lower in fat, baking not frying. 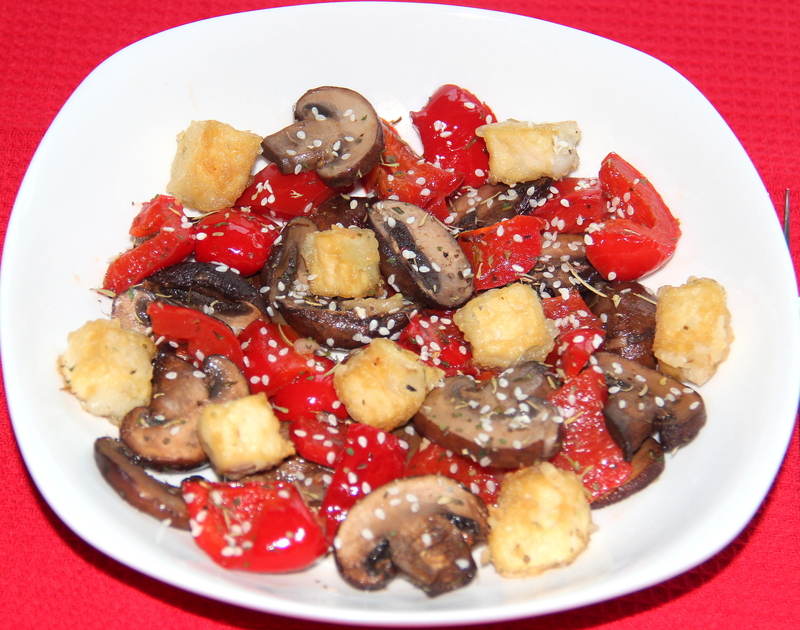 This is a delicious dish, love the mushrooms, tofu and red pepper together.